Who do you think will take the titles on the final day at the Seamaster 2017 ITTF World Tour Czech Open. Mima Ito could be looking at a double crown if she can kick off the day with a win in the Women’s Doubles final. Partnering up with Hina Hiyata, the pair haven’t dropped a game en route to the final, knocking out the no.1 seeds along the way. They have almost won two points for each one taken by their opponents, having won 100 points lost 56. The Japanese duo will be tough to beat in the final. Their opponents will be no.2 seeds Matilda Ekholm and Georgina Pota. The Swede and Hungarian have dominated in similar fashion, just dropping one game up to this point. Ranking dictates they are favourites, but they can’t help feel like underdogs heading in to the final. But this may suit them just fine. No surprises so far for the top seeds in the Men’s Doubles. The top two pairs have progressed to the final as expected. Patrick Franziska and Jonathan Groth both made early exits in the singles event, but this could be to their advantage. Coming in to the final the pair hasn’t had to make any compromises to their preparation during the tournament. Their focus solely set on the doubles they have dropped just one game. Meanwhile Jin Ueda and Maharu Yoshimura have both come out on the wrong end of some marathon matches in the Men’s Singles. It will be a classic matchup of European and Asian styles clashing, but the German and Dane will be fresher heading to the final and look set on defending their no.1 seeding. In the Women’s Singles it’s an all Japan final with Kasumi Ishikawa squaring off against Mima Ito. The no.1 seed is favourite in every way. Ishikawa has the higher ranking and when it comes to head to head she is undefeated with four wins. 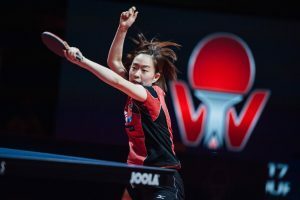 But there’s a first time for everything and this could be the moment for Ito to seize the opportunity for a World Tour title and a win over her compatriot. But what are her chances? Ishikawa has grown up playing against the pimple backhand, having emerged on the scene during Ai Fukuhara’s dominance. As a left-handed player the backhand is also further nullified, with Ishikawa having extra time on the cross court wing to adapt to the irregular ball and create topspin to overcome its effects. Ito is going to have to bring something new to game to stop the head to head becoming five to zero. In the Men’s Singles final it is a classic matchup of youth and experience. Tomokazu Harimoto survived consecutive seven game matches to make the final, saving five match points against Hugo Calderano along the way. Meanwhile, the no.1 seed Timo Boll had minor blip in the second round, making a comeback to win in seven games. Since then he has cruised, not dropping a game in the last two rounds. Boll said this before his straight games win his semifinal match against Emmanuel Lebesson, so the German must be happy with how things have gone so far. Meanwhile, Harimoto, more than two decades Boll’s junior, will be running on pure adrenaline. It won’t matter if there are only fumes left in the tank, kid table tennis won’t slow down. The pair met for the first time in the semifinal of the 2017 China Open, and experience prevailed then 4-1. It’s going to be an onslaught of attacks from the rising star from Japan, but the German’s fresh legs should see him over the line.